At the time, GSA was “testing” the design-build delivery method for this program type (it was one of three courthouses being built). 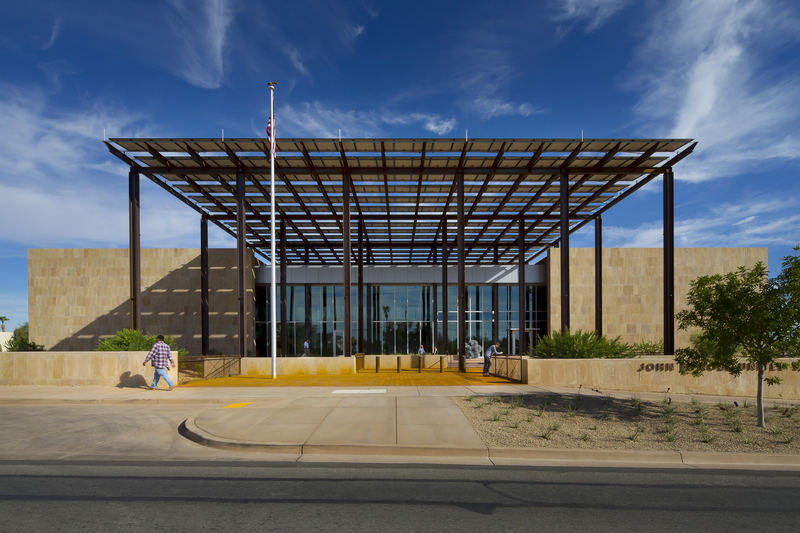 The John M. Roll Federal Courthouse sustainably reinterprets and updates classical American courthouse design for the community of Yuma, Arizona. The LEED Gold 60,000-square-foot building won a design-build competition sponsored by the General Services Administration (GSA) Design Excellence Program. The uniqueness of this new justice facility located on the U.S.-Mexico border demanded a variety of design solutions tailored to its unusual program. John Roll, the state’s chief federal judge, declared a judicial emergency and was an energetic advocate of the building’s design. Following Judge Roll’s death in the 2010 slayings that also gravely injured Congresswoman Gabby Giffords, President Obama signed into law a measure naming the new courthouse after him. The courthouse’s primary purpose is to process defendants en masse in a safe, speedy and humane manner, while also offering a welcoming landmark to the citizens of Yuma. General Contractor: Sundt Construction Inc.